Colorado Parks and Wildlife aquatic biologists and volunteers each carried 10-pound bags of rare greenback cutthroat trout up steep Herman Gulch near Georgetown this week in a bid to permanently return the state fish to its ancestral waters in an alpine stream fed by snowmelt. CPW biologists hope the fish, each a year old and about 4 inches long, will thrive and continue the long process of restoring the native greenback in its historic habitat of the South Platte River drainage and remove it from the U.S. Fish and Wildlife Service's list of threatened species. But there are no guarantees that all the hard work will succeed in rescuing the rare fish. 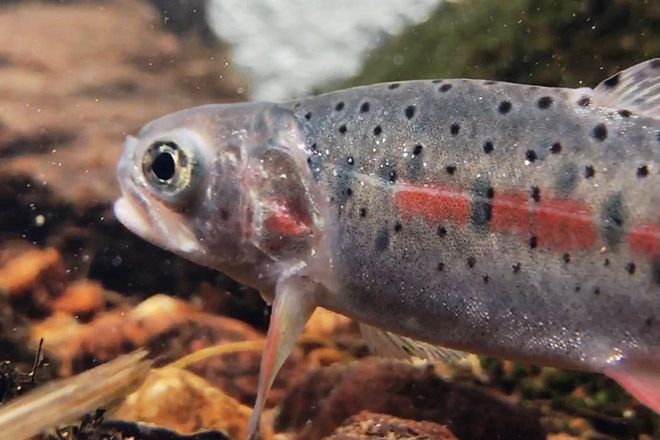 Still, CPW and its partners at USFWS, the U.S. Bureau of Land Management, the U.S. Forest Service and the National Park Service, are determined to try to save the greenback, honored as the official state fish of Colorado. Since discovering in 2012 the pure greenback population in a tiny ribbon of water known as Bear Creek on the southwest edge of Colorado Springs in the Arkansas River drainage, CPW staff has mounted a massive effort to walk Bear Creek, collect and spawn the fish each spring, rear them in hatcheries and now painstakingly stock them in a reservoir and two streams that the agency cleansed of other non-native fish to create the best conditions possible for their survival. Despite all that work, the first stocking effort of 4,000 tiny, one-inch greenbacks on Herman Gulch and Dry Gulch last September was somewhat disappointing. A recent survey of the streams found no survivors. As a result, CPW decided to restock July 17 with 960 older, more robust greenbacks. The earlier release date also was designed to give the fish more time to acclimate and grow before winter. What CPW researchers know is that it takes approximately 3 years to restock and establish fish in a stream. Presiding over the restocking effort were Boyd Wright, CPW's Northeast Region aquatic conservation biologist and Paul Winkle, area aquatic biologist. Also assisting was Harry Crockett, CPW's native aquatic species coordinator and chairman of the multi-agency Greenback Cutthroat Trout Recovery Team. "This is a really big deal," Crockett said of the effort that saw dozens of volunteers serve as fish Sherpas hauling bags up fish up four miles of steep terrain to find ideal spots along Herman Gulch where the greenbacks might take residence. "We need to get these fish in here and see them survive." To prepare the streams as greenback incubator sites, CPW staff in 2015 walked each, mile by mile, electroshocking about 600 hybrid cutthroats and carrying them out for relocation in Clear Creek. The streams were chemically cleansed of other species so baby greenbacks might thrive. Then came the stocking of tiny greenbacks last September, the survey for survivors last week and finally the second restocking July 17. Though greenbacks stocked into Zimmerman Lake west of Fort Collins are thriving, biologists want to see them restored in their more typical habitat: cold, clear, alpine streams. "This is a fish that evolved in streams over thousands of years." Wright said. "Then it was almost wiped out in a century and a half of human interference. This is where we want to see them back and thriving again. Here in the wild." The long-term goal is to have greenbacks populating a network of streams like Herman, Dry Gulch and Clear Creek, for example, throughout the South Platte drainage. But for now, CPW biologists have to get them to survive a winter. "The vision is a metapopulation with connected streams," Crockett said. "But that's a long way away. For now, we've got to maximize the genetic diversity that's left and get them to take in these streams." The survey and stocking efforts will be repeated next year and biologists will be able to track the cutthroats by scanning them with a wand to read identifying tags inserted in each fish. Among the nonprofit conservation organizations providing a small army of several dozen volunteers to assist in the restocking was Trout Unlimited and its member, Joe Haak of Castle Rock. He labored up the trail about four miles, determined to get his fish in the water in the two-hour window allotted by the scientists, because he feels so strongly about the CPW mission to save the greenback. "It's an honor to be a part of this important work," Haak said as he gently coaxed his 10 greenbacks into a calm pool under two boulders, protected from the swift whitewater of Herman Gulch. 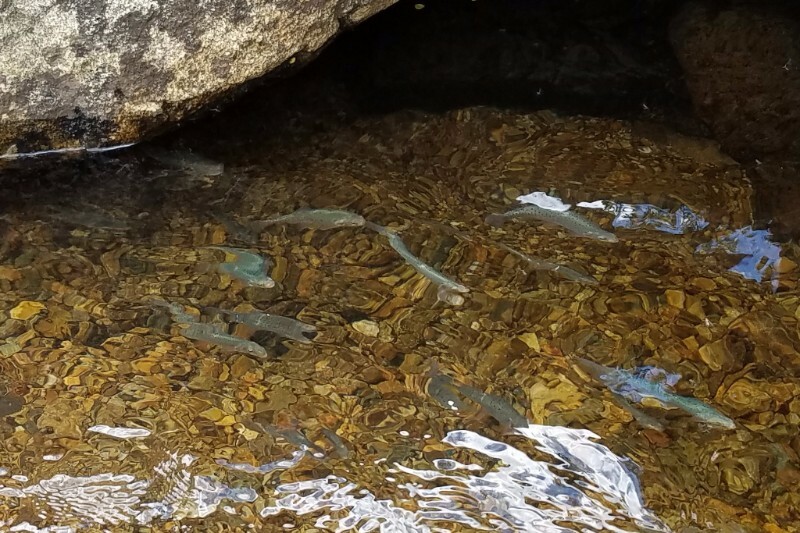 "I feel like I'm kind of a dad to these fish," Haak said, watching with pride as his greenbacks hovered in the stream, surfacing to eat insects on the surface. "I wanted to be a part of history."